I planted a Saskatoon serviceberry bush last spring (2017), so it is in it's first full year this year. 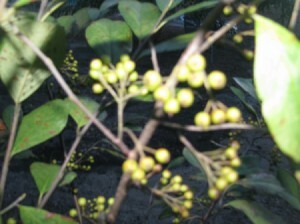 Last year it produced very small green berries that did not ripen. I put it down to being the first year. This year, it is a little over 5 feet high and has produced many berries, but as yet, they are still very small, hard, and green. Do I need more than one plant for cross pollination? More and/or different fertilizer? Or more frequent watering? If we do not have rain, I water thoroughly at least twice a week. As you can see in the photo, the plant also has brown spots on many of the leaves. We have had almost monsoon type rains on the east coast this year and I'm wondering if it has been getting too much water. Any advice is appreciated. I live in New Bern, NC. Normally it takes 3 to 5 years for any tree to produce fruit that can be eaten. At the end of the growing season just before winter, you'll need to trim back the tree just a bit and cut off all the branches with fruit on them. You can do this before fall or wait till early spring. If you have harsh winters it is best to wait until early spring. You may want to to get their take on your situation. What we do in my area may be totally different than yours!